We're just past midway in the summer and we're feeling it. After three days of three dives a day we were beat. Peter's come up lame. We've both had ear problems and multiple boo-boos. Just when there's little in the way of current. Just when we can just hang suspended in the water column in an aquatic "spacewalk." Just when the water should be at its clearest, there are rains to the north. 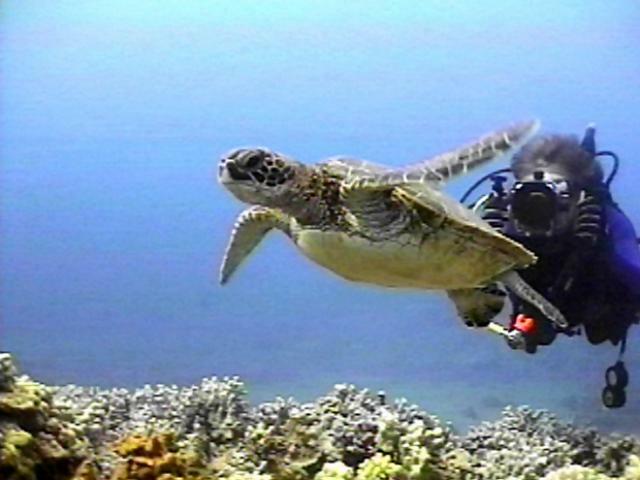 The last two days our visibility has dropped and so has our number of dives. 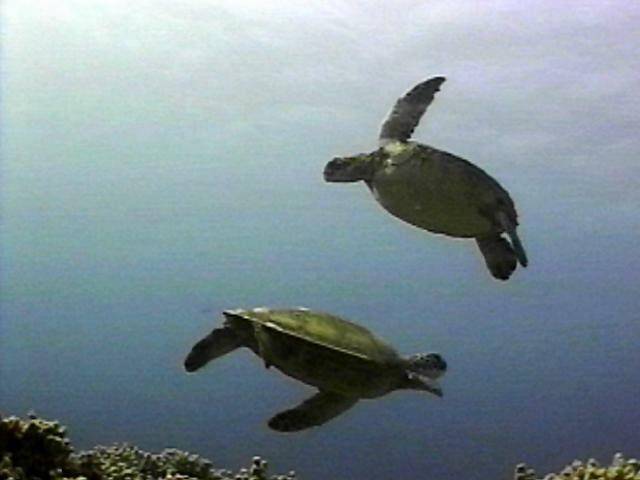 When the water is this turbid (we can taste the soil/sediment through our regulators) the honu prefer to stay "home." That means they spend all their time in their tramples, save for those few times when they skate to the surface for a breath of air. Borrrrrringggg... Sure, this is an opportunity to count them--they look up at us placidly--but the potential for good photos and video are virtually non-existent. Despite that, we do have a few interesting things to report. Makana and Akebono are youngsters. 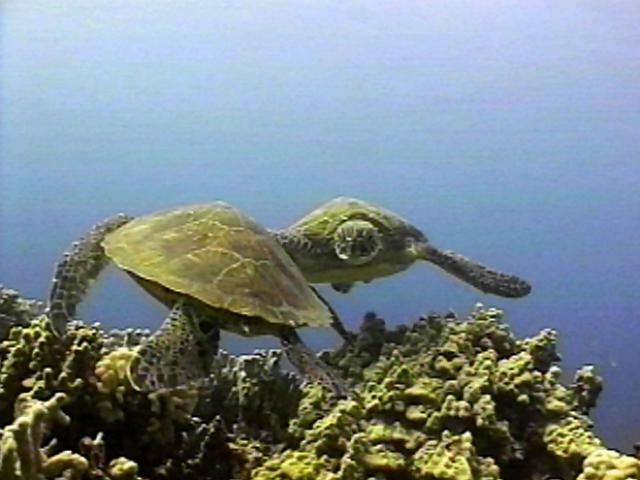 Makana is a small turtle that has been at Honokowai since 1998. Akebono is a teeny tiny brand new arrival. They have discovered each other, and like all youngsters, that means they take the opportunity to play. Akebone slid into her ledge after returning from the surface. Makana approached and gave her a nip to the beak. That did it. Akebono chased Makana. The "fight" was on. Akebono chased Makana. The "fight" was on. We were thrilled to witness this special underwater ballet. Each little turtle was trying to nip and bug. They looked all the world as though they were just enjoying each other's company and the sensation of "flight." They looked all the world as though they were just enjoying each other's company and the sensation of "flight." Our interest in what turtles eat continues. We sighted Keoki the hawksbill again this week. The one time she showed up, we were lucky enough to be able to videotape her foraging behaviour. Keoki really has to "work" for her food. This is very different from the open-your-face-and-grab-seaweed style of the honu. We managed to find some of the forage Keoki targeted. 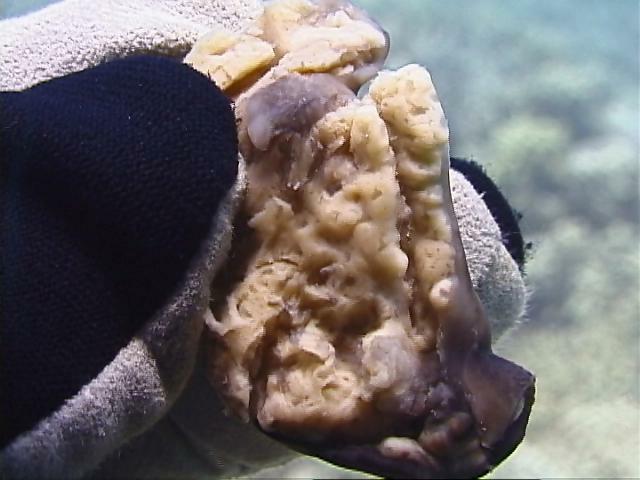 It has been tentatively identified as the "common sponge" Chondrosia chucalla. We managed to find some of the forage Keoki targeted. We thank Ralph C. DeFelice of the Department of Natural Sciences, Bernice P. Bishop Museum for his assistance. Our bloom of Cladophora sericea continues. 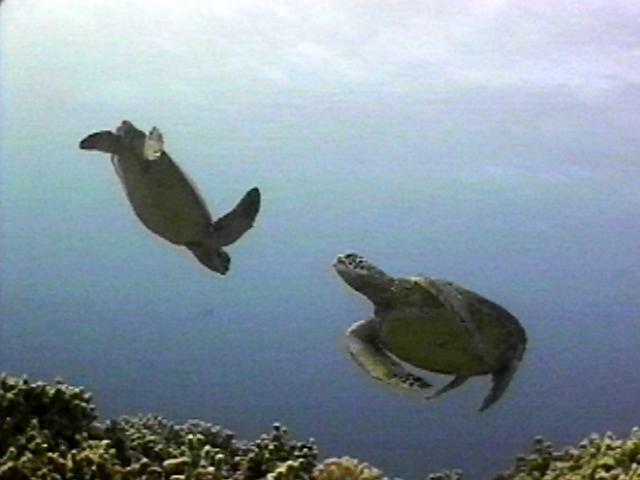 On a late afternoon dive, we watched a turtle land in an algae field and begin feeding. We're not sure if it was targeting the Cladophora or some other algae. This was an unfamiliar turtle and we were reluctant to get close. 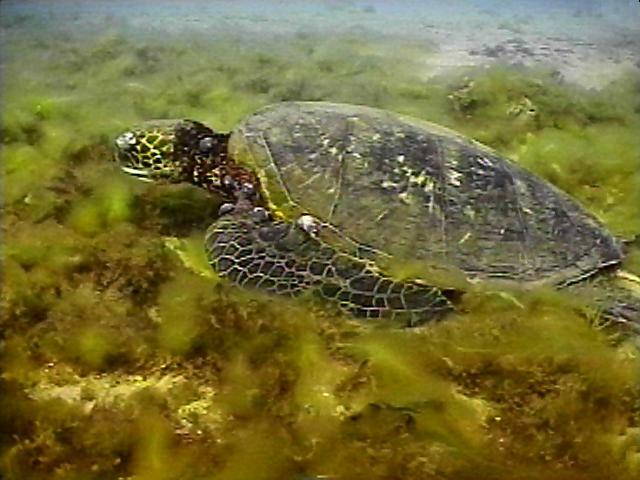 On a late afternoon dive, we watched a turtle land in an algae field and begin feeding. 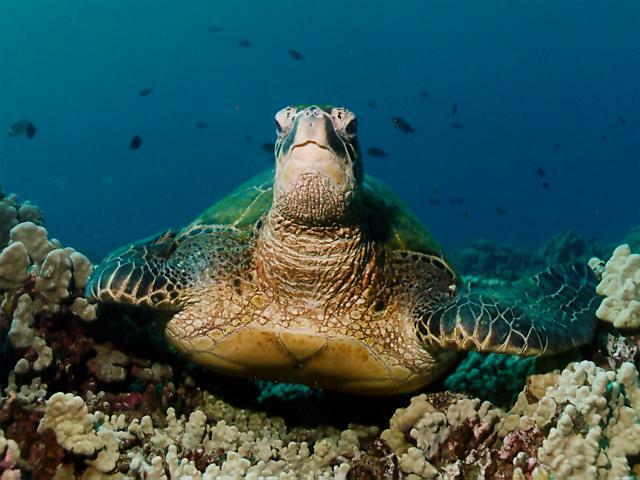 We could explain why honu fascinate us so much. Why we love them. How privileged we are to be accepted by them.